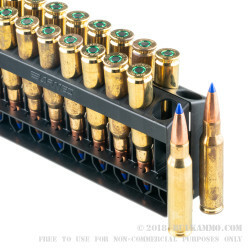 Barnes ammunition has always been legendary for its performance. With the introduction of the 150gr .308 VOR-TX Tipped Triple Shock bullet, Barnes has now taken center stage once again as an industry leader in long range bullet performance. 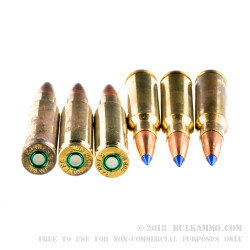 The 150gr solid copper tipped triple shock 308 bullet is forged from 100% copper, and features a polycarbonate tip embedded within the bullets nose cone. This polymer tip serves to both increased bullet velocity by further streamlining the round, and also aides in the expansion of round by spreading the hollow point cavity outward upon impact. Nearly 99.1% weight retention is achieved through utilizIng that same solid copper construction, and translates to a deeper, more expansive permanent cavity than any other competing round. At the muzzle, the round delivers a staggering 2,649 foot lbs of muzzle energy, and is capable of supersonic flight out to nearly 600 yards. 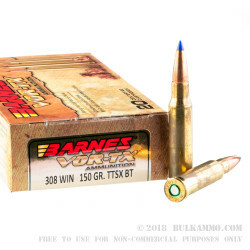 Ideal for hunting boar, whitetail deer, and even bighorn sheep, the Barnes 150gr .308 VOR-TX ammunition is the round chosen by professional hunters worldwide. 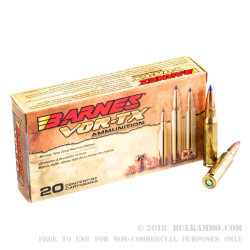 If you are looking for the round that has earned the reputation as the perfect hunting bullet, you are looking at the Barnes 150gr 308 VOR-TX.